I have been using Windows 8 for a while. As most of us know it’s primarily for touch screens which can create some issues on the desktop. Most softwares I use are usually placed on the Task bar. Up to Windows 7 it worked well out. With Windows 8 I started to notice that I sometime cannot access the Task bar. In other words it’s not accessible. Perhaps I have not found out the right keys combination. 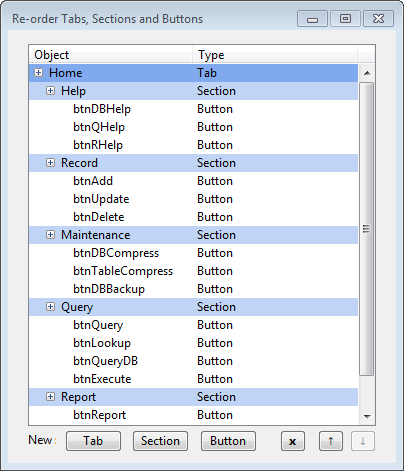 Of course, an even better solution may be to skip the Task bar in the first place. So I decided to create a small utility, App Launcher, where my favorite tools are available for me. The screen shot below shows the UI for App Launcher. App Launcher is a test pilot. If things go well I will create a better tool that makes it possible to add/remove/replace tools. But at present I will test the App Launcher to find out if it suites me or not. Is this kind of tool attractive for other users as well? Edit: What I originally forgot to mention in this article is that with a (free) tool like App Launcher it will also be possible to start the tools with various start parameter(s). 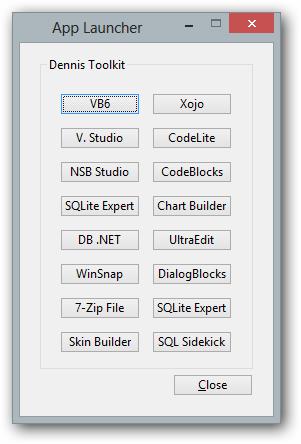 PS: App Launcher is created with Xojo. This is the first post of a series that will present controls and tools by Jérémie Leroy. First out is the tool for creating Ribbon UI in an easy way. 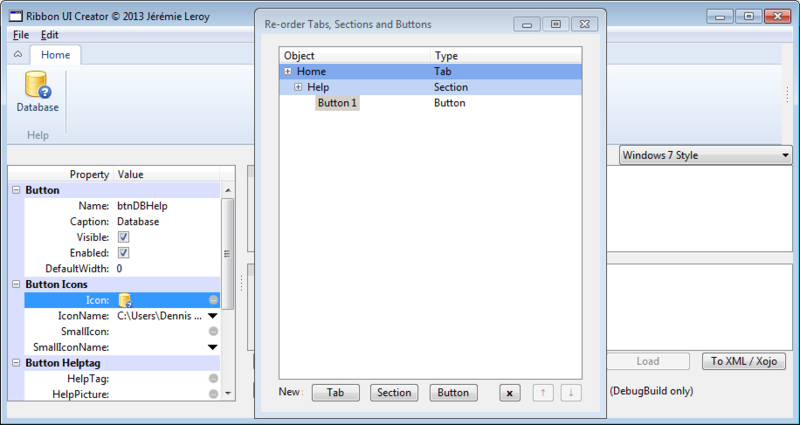 It’s a visual designer tool that generates the required code to show and use the Ribbon UIs. Interesting, when creating the Ribbon UI and the code for it we actually run in Debug mode. The last step to do is to generate the code to create the Ribbon UI. 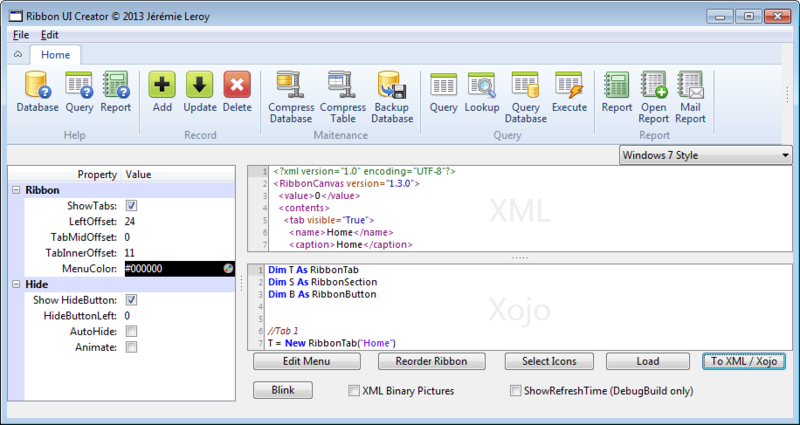 Click the button To XML/Xojo and it will very fast generate the required code to build the customized Ribbon UI. 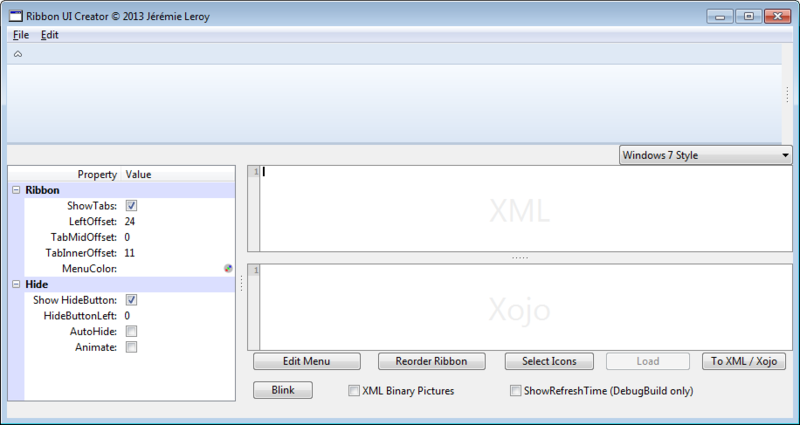 The next and final step is simple to cut & paste the generated Xojo code to the Open event of the RibbonCanvas objectet. As we can see, it’s a quite straight forward code. It simple to follow and to maintenance it. Edit Note: Of course, I should also mention that the professional icons in use are made by Axialis. I’m getting worried over what’s going on. For every new version of Office and Excel there has been a positive tone in the online community and an excitement with the new features. But that’s not really true with MS Office 2013. The terms to use a license shrink and some features are no longer available in some packages like Office Professional effectively prevent all happiness with the new version. Instead of going on with the details I give two URLs that explain the new issues with Office 2013. If we view it friendly we could say that both the new license agreement and the lack of some tools are due to that the new version actually targets smart devices and pads. It makes sense that softwares are tight to the devices in a different way than to the Desktop platform. However, the future is not here yet so still the Desktop platform plays a critical role and will still do it for some time. The only reasonable conclusion is to not upgrade to MS Office 2013. If we have MS Office 2010 there is no reason to upgrade to MS Office 2013. If we have MS Office 2003 or MS Office 2007 then consider to upgrade to MS Office 2010 but not MS Office 2013. The above two alternatives offer best value for our money and still support our business very well. It will also send a clear message to Microsoft: Do it again! Do it right!